1. Heat oil in the frying pan. Add the onion, saute for few seconds. 2. 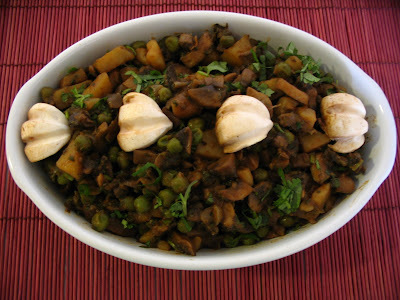 Add the potato, mushroom, peas and add the chilli and garam masala. 3. Divide the coriander to 2 portions. one portion add to the veggies. 4. Add salt and saute it for few seconds. 5. Now add water so that the veggies should be immersed 3/4th. 6. Close with lid 3/4 th and let it cook until all the water is absorbed. 7. Now add the remaining coriander and dollop of butter serve hot with roti and rice. 1. The left over of this can be used for bread making bread sandwich..tastes great. 1. Puree the tomato and garlic and strain it using strainer. 2. Add them to the flour and make dough by adding chilli powder and salt to it. Divide into equal balls. 3.Take a ball, press it in dry flour on both sides. Roll into a circle. 4. If the dough sticks to the rolling pin or rolling surface, lightly dust it with dry flour. 5.Heat the skillet . Place the chappathi over skillet. They start puffing with small bubbles now flip over another side press slightly with spatula so that it puffs well again. 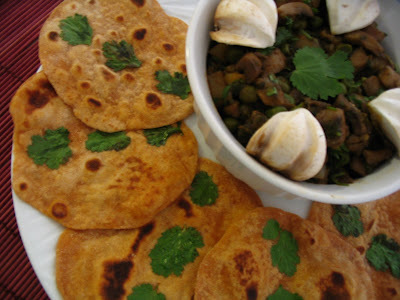 6.Make chappathi and serve hot with curry or raita. You can add chopped coriander , mint or methi to the dough. Thanks for those lovely words in my alagar koil dosai dear. Tomato chapathi is very new to me. But seems so attractive. Should try soon. Potato n mushroom curry with that butter decoration makes me drooling. Seems like a feast for me. Viki those are not butter , they are button mushroom. Tomato chapathis are so new to me sounds good. 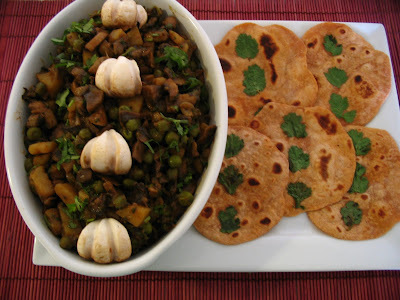 Mushroom curries are always a favorite at home.. fast to cook and good to eat. That putti putti chapathy's are tempting me gal.....I do something like this for me....Love to be kid sometimes..he he..
Wow tomato chapathi. Looks yummy and lovely. Delicious curry. today, will let u know how it came. Wow you are so innovative Pavithra! Love your unique dishes. Tomato chapati looks so delicious. Hvae to try soon! The mushroom curry looks great too. I have never tried chapatis with tomatoes .. very innovative .. shall try it ..
Woww cute tomato chappathis, looks fabulous, am drooling over the potato and mushroom curry...am a great fan of ur creative and lovely presentation Pavithra! New & nice chappathi, delicious curry, lovely presentation. that's the kind of vegetarian food I love! Very tasty looking, yummy! wish i wud have come here a lil earlier..will try this tomo!! wow! innovative idlis, dosas and chappatis! Awesome! Im ssure u'll have a huge crowd making tomato chappati nexT! Wow, very innovative Pavithra as usual, I appreciate you take time to organise your plate so nicely, I feel like having from the dish right away..
That looks beautiful and healthy! THose chappathis are very cute and small. thnks for letting me know..that is super quick and easy yaar..thnks for givin the recipe!! Nice presentation.Love the cilantro on chappathi.Delicious dishes. wow u r so creative..looks really good,bored of usual chappathies,great idea..will giv it a try..ur tomatao dosa is becoming so famous dear,i will also try..
Lovely presentation I like what you did with the mushrooms. The combination seems great will have to give it a go as my husband likes mushrooms a great deal. You love tomatoes don't you girl? Loved the tomato dosa and now this tomato chapathi. wow never heard of a tomato chapathi.......looks awesome dear!! 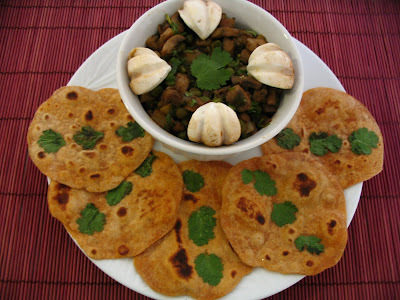 wow what a combination .I always like your presentation that make s your dish looks more yummmy and potato and mushroom a new combination for me and tomato chapati also both looks so yum yum . Will give a try soon. Thank you for stopping by my blog. I appreicate your kind comments. Your food looks so appealing and your photography is wonderful!!! I invite you to join me on blogger at http://fromadietitiansperspective.blogspot.com or on twitter at: http://www.twitter.com/anthonyjsepe . Have a wonderful day! YUM! Loving the Tomato chapatis, good job! You are always invivted to our bbq party pavithra..Beautiful presentation and looks great..
Tomato chappathi is new to me..The curry sounds yummy too. Nice shots Pavithra. this is my first visit to ur blog... good recipes.. If u have time, pls check out my blog!!! Mushroom my all time favourite..and Tomato paratha this is very new concept... to me.You have very great idea too...Pavithra. Wow actualy i have to thank you first for this lovely post. Tomato chappti and a very differnt curry. I love potato and mushroom. I feel like grabbing them from the monitor. Lolz.. Thanks everyone for ur wonderful lovely comments..